Projects for a New Millennium (Projects2k) presents the highly awaited Stony Creek Quarry Spectacle—TERRA TRACTUS: The Earth Moves—on Thursday, Friday, Sunday June 19th, 20th, 22nd (summer solstice weekend) and Wednesday-Sunday June 25th -29th ! 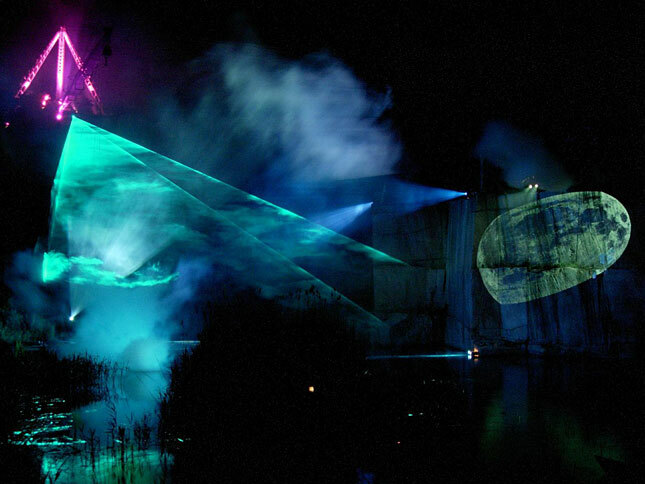 The performance tells the story of the Quarry’s geological and human history from past, present and future using dynamic, multi-media marvels, including projected and laser light, original music, pyrotechnics, climbers, dancers, environmental kinetic sculpture and much, much more. Projects2k’s many multi-media shows, including those at Avery Point, the Branford Green, and Yale’s Woolsey Hall—in addition to four previous quarry performances—have demonstrated the power of sculpture, music, lighting design and other technologies to creatively illustrate the history and science of our natural world and our role in it. Project2k’s events are always widely anticipated, and continue to amaze all who attend. The show is presented in celebration of Projects2k’s 20th year as an Art/Science/Environmental not-profit and in memoriam to its founder, artist and advocate Joy Wulke. TERRA TRACTUS is Joy’s final work, and Projects2k is honored to bring her collaborative vision to the Connecticut Shoreline community. Eight performances only! Note remote parking only (except with limited VIP ticketing option) at Francis Walsh Intermediate School, 185 Damascus Road, Branford, CT 06405. Shuttle Service to the Stony Creek Quarry in Branford begins at 6pm; Food, Tai Chi and Preshow experience at the Quarry from 6pm on; one-hour lightshow begins at 8:15 dusk! Food trucks from local restaurants will be on site for pre-performance dining. Tickets available at www.EventBrite.com search term TERRA TRACTUS. Joy Wulke, author; Jamie Burnett, set and lighting design; Istvan B’Racz, composer, sound design; Tom Burnett, director; Dan Fine, Matthew Ragan, projection designers; Nazorine Paglia, choreographer; Margaret Carl, stage and costume manager; Alice-Anne Harwood, Neighborhood Music School, David Salinas, Digital Surgeons, Miguel Baltierra, outreach coordinators; Silas Finch, artist/ rock climber; David Connell, Gioia Connell, Robin Comey, co-producers. The David Bermant Foundation, CT Commission on Culture and Tourism, CT Department of Economic and Community Development, Ethel and Abe Lapides Foundation, Housatonic Museum of Art, New Alliance Foundation, Tilcon CT Inc. & many individual contributors! The Stony Creek Quarry in Branford, CT has yielded its unique pink granite for over 150 years, and is estimated to contain enough granite for 200 more. This type of stone can be found in Grand Central Station, the base of the Statute of Liberty and Grant’s Tomb, just to name a few. The sheer, 200ft rock faces provide an awe-inspiring backdrop to the Quarry Spectacles. Projects2k is a 501(c)3 non-profit collaborative that fuses art, science and the environment to create a sense of wonderment for our natural world. Throughout its 20-year history, Projects2k has aspired to design presentations and educational programs that foster environmental stewardship by artistically interpreting local history, geology, ecology—and their common heritage. For more information and beautiful images, please visit www.projects2k.org.